The hot midday sun is now low in the sky as we feel the evening breeze kick in. The ceiling fan whirs and I am certain we have every window in the house wide open. We don’t often have the need for air conditioning and prefer to let nature have its way with us. That doesn’t mean we can’t help accelerate the cooling process. A round of icy margaritas is in order. A quick assessment shows we are short on limes but the 4 large grapefruits snagged from a good friend’s tree volunteer themselves. Enough juice to fill a large jar, a squeeze of agave syrup and the lone lime gives us a strong, bitter-sweet base. A bowl of cherries become the impromptu sweet garnish for this bold but refreshing twist on the margarita. 1.5 oz. good, smoky mezcal – we like Sombra for this. 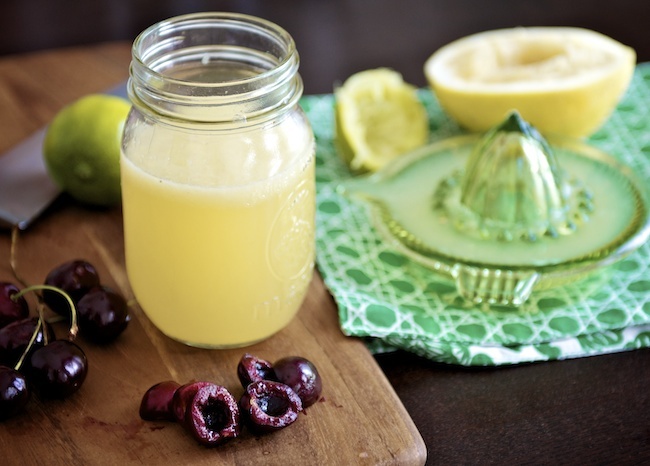 Combine all ingredients in a shaker of ice, shake vigorously to extract some juice and color from the cherries. Serve over ice in a large double old-fashioned glass. The smokiness of the mezcal blends well with the bright and bitter grapefruit. The cherries add a cool sweetness, soften the tangy edges, and offer a little rosy blush to the whole concoction. Nice. What’s your favorite margarita recipe? Drop it in the comments, discuss it on our Facebook page or Tweet it out loud.